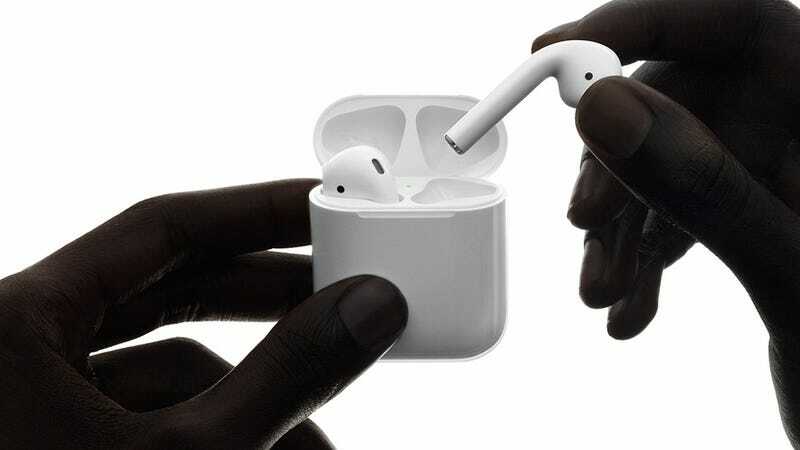 Starting with Apple’s wildly popular wireless earbuds, the upcoming AirPods 2 are expected to essentially look like the current model, but they may come with improved bass and a grippier, non-slip coating similar to what Google uses on the back of the Pixel 3, according to a source that spoke to MySmartPrice. Those rumored improvements don’t sound like a massive upgrade, but if you combine them with the added sensors and upgraded health and fitness tracking previous rumors have mentioned, then AirPods 2 are shaping up to be a solid compliment to any iPhone owner’s kit. Sadly, MySmartPrice claims the new AirPods won’t get much of a boost—if any—when it comes to longevity, as the new model is said to have the same-sized batteries as before. That’s a bit of a bummer, as one of the biggest issues with the AirPods right now is their mediocre battery life. However, it’s rumored that Apple will offer the new AirPods in both white and black, so at least you can avoid looking like the millions of other people walking around with Q-tips sticking out of their ears. The other potential bad news is that, along with better audio and health tracking, the next AirPods may be more expensive, starting at around $200 compared to the $160 price tag for AirPods today. Then there’s the rumored iPad Mini refresh. I had essentially given up hope about ever getting a new one, but a new report from Mac Otakara claims an iPad Mini 5 is indeed on the way, featuring the same design and dimensions as the iPad Mini 4 (which was released nearly four years ago). That’s both good and bad news, because while the size of previous iPad Minis made it ideal for reading comic books and magazines on the go, it’s underwhelming to hear that the iPad Mini 5's bezels may be largely unchanged and the device may still feature a lightning port instead of USB-C.
Mac Otakara says the iPad Mini 5 won’t get a brand new processor, and instead may rely on an A10 chip (the same as what’s in an iPhone 7), or an A10X chip (which is what’s used in the 4K Apple TV). Finally, the same source who talked to MySmartPrice about the AirPods 2 reportedly mentioned that Apple’s wireless charging pad—which was first announced back in the fall of 2017—may also finally arrive this spring. However, since the product was first teased, AirPower seems to have undergone some adaptations. MySmartPrice says the new charging mat will be “slightly thicker than originally expected” due to a new 8-7-7 wireless charging coil configuration. The rumored wireless coil setup seems to address previous reports claiming AirPower was “doomed” due to poor heat management that caused devices to overheat while charging. MySmartPrice also added that Apple is planning on creating some “exclusive” features for AirPower, but those features might not be available until iOS 13 gets released in the fall. That means AirPower, with a rumored launch price of $150, might initially just be a pricey alternative to multi-device wireless charging pads like the SliceCharge mat I tested at the tail-end of 2018. However, if all these different products do pan out, Apple fans could be in for a much more interesting spring this year than in 2018, when all we got was a refreshed 9.7-inch iPad with Apple Pencil support.